Just got home from a brilliant trip to México City, so sorry for the sporadic posting the last few days. I have a billion photos to sort and upload, plus film and suchlike pandemonium. Here's a teaser. Stayed tuned. 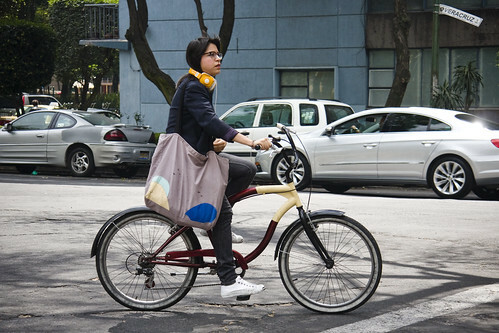 Mexico City is a mad, brilliant, fantastic place and the bicycle is back. Looking forwards to seeing your shots! Hey, it's good to know you´re back. Hope you have enjoyed your trip to this city. As you said, it seems a wild city. Nevertheless i like to live here and ride my bike when i have enough time to do it. I will be waiting your comments and pics. I couldn't get the sticker!! LOL. Good to have you i Mexico Don Mikael - now you know this city has potential and looking much forward to see your CycleChic photos soon. Especially the ones from parque Polanco of the married couple. She's cute. and a nice bike.